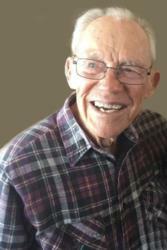 Paul W. Norviel, age 95, passed away on January 23, 2019 at his home in Elephant Butte, NM surrounded by his family. Paul was born on September 5, 1923 in Garfield, NM to Leroy and Beulah Lee (Ely) Norviel. He was raised on the family farm in Salem, NM until joining the U.S. Navy and serving on the USS Platte for the duration of WWII. After returning to Los Angeles, he worked for Virtue Bros. Paul then returned to the Southwest, taking up farming in San Simon, AZ. He traded the farm for a Motel in Tucson, AZ. Paul worked at Duval Mines before moving to Deming, NM, where he owned McLain’s Truck Stop Restaurant. Once again moving on to Gallup, NM becoming a partner at Yah-ta-hey, learning about the Indian Jewelry business. He then moved on and partnered with his brother to open Buffalo Trading Post in Algodones, just north of Albuquerque. He continued to be an entrepreneur in Santa Fe buying and selling real estate. Once retired, his son-in-law, Pat, introduced him to fishing. Well that did it! He moved to Elephant Butte and worked as hard at fishing as any job he ever had. There he met and married Betty Reed. They created a home to cherish, entertaining their combined families. Fishing, boating, skiing; the grandkids had a ball. Paul and Betty enjoyed their neighbors and family, playing cards and dominoes. Paul also loved to go for long walks and go hunting. In camp, the younger men joked about “the Old Guy” walking them into the ground! Paul will be missed by his family and friends. His children La Joya Marilee Bonnell, Cheryl Gunn (Pat), and Paula Reese (Tim); grandchildren - Dru Ruebush, Cara Evans (Rob), Lauren Schellhase (Cody), Haley Chapman (Joe), Lindsey Dickerson (Jesse), and Noelle Gunn; great-grandchildren - Ellie, Gwyneth, Spencer, Mikaela, Wesley and Madison; sister, Grace Parnell; nephews – Tom Jesse and Tom Case; and nieces – Barbara Moore, Charlotte Pinkerton, Verlinda Angell, and Valorie Nagy. For those who really knew Paul, knew a man who could make you laugh or cry, and you loved him no matter what. Cremation will take place and a Celebration of Life will be held for his family and friends on Sunday, February 17, 2019, at 12:00 noon in his home at Elephant Butte. Stake out the big ones, Paul, because we'll fish together again one of these days! I am very sorry to learn that Paul has passed away. He will be dearly missed by all that knew him and he will be cherished in memory. I hope a passage at John 5:28, 29 brings comfort to all who are grieving. May we all look forward to seeing our loved ones like Paul again in the future. Sweet Papa Paul! <3 Amazing man who left a lasting impression on me. All the love and light. What a joy to have known and associated with this wonderful person. We only knew him for the past 7 or 8 years after we moved to the Lost Canyon area of Elephant Butte. He was an inspiration to all with his great sense of humor and friendliness. Those fortunate enough to know him will miss him. God bless the family. My mom, Grace, cries for the loss of her big brother. She misses him--but smiles with total love in her heart for the wonderful memories and times they shared. This is a family love and legacy that lasts. A great man that made his mark on the world with his wonderful children Rest In Peace Paul.